Under a microscope, the textile looks like a gnarly sandwich. 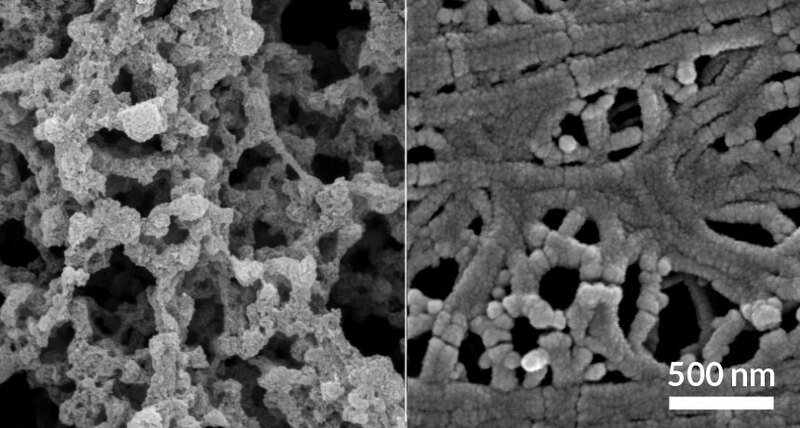 Layers of nanoporous polyethylene, or nanoPE, hug two layers: a rough, porous carbon and a smoother, tighter copper. When the carbon faces away from the body and a thin nanoPE layer is near the skin, the textile is in cooling mode. Body heat can easily escape through the carbon structure. In experiments, the textile lowered the temperature of artificial skin by about 3 degrees. To warm the body, the fabric is reversed so that the copper layer — which doesn’t let body heat easily escape — faces out, and a thick nanoPE layer is near the skin. In warming mode, the artificial skin heated up by about 4 degrees. This sandwich design adds heating and refined cooling capabilities to nanoPE, a cooling fabric that the Stanford team developed in 2016 (SN: 10/1/16, p. 9). Though the new plastic-based material is not ready to wear, the team is developing a fiber-based version “that has a much similar touch and feeling to traditional textiles,” says mechanical engineer and study coauthor Po-Chun Hsu.